It seemed as though the timing and circumstances couldn’t be worse for USMNT to take on their most heated rivals in the heart of the lion’s den called “Estadio Azteca.” Access to Europe-based personnel was sparse due to the eminent kickoff of most European leagues and Mexico was riding their biggest wave of confidence in years just days after striking gold in London. The chatter of their new place among the world elites echoed around the press. Gringos worried about a potential thrashing found no reassurance in Jurgen Klinsmann’s cobbled together starting lineup which consisted of, get this, 5 central mids (Jermaine Jones, Maurice Edu, Kyle Beckerman, Danny Williams, and Jose Torres)–6 if you include converted CM Geoff Cameron. There weren’t all playing CM, of course, and Torres was the only attack-minded player of the bunch. His job, presumably, was to link with lone ranger Herculez Gomez, but Mexico’s possession-minded 4-2-3-1 (66% of possession, in fact) kept the US sitting so deep that Torres was a non-factor. To call USMNT's lineup "makeshift" is a bit of an understatement. The USMNT backline was understandably shaky, as it was their first time playing together and Fabian Johnson was playing out of position, not to mention the factor of playing in Azteca where hearing oneself think is a challenge. In what looked like a sign of things to come, Jones and Maurice Edu, platooning at center back instead of his normal defensive mid spot, had a miscommunication just seconds into the match, which allowed Angel Reyna to slip between the US midfield and defense to earn a dangerous free kick. Fortunately, Mexico’s constant attacking threat never led to a goal. Much of the post match praise was given to Edu’s partner, Cameron. By most superficial measures, Cameron had an outstanding game; he and Johnson were clearly the best defenders on the field. But careful analysis shows that while Cameron was at times brilliant, his match was not, in fact, stellar. He was beaten badly by Aldo De Negris and Chicharito in two situations that could easily have led to goals. And despite a few brilliant plays, he was only successful on 7/13 clearances. However, one of those clearances was a brilliant headed stop of a cross just in front of goal, a service that Chicharito surely would have finished to give Mexico a 1-0 advantage. 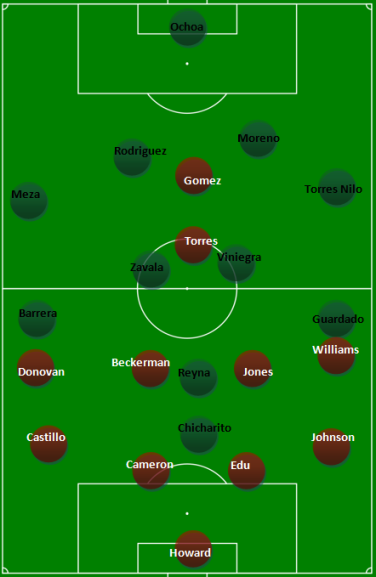 Up front, the US attack, missing Michael Bradley, Clint Dempsey, and Jozy Altidore, rarely threatened, but the preponderance of central midfielders did serve to clog up the middle for Mexico and force them wide. Consequently, this pressured the US into constantly clearing crosses. Mexico's key passes (right) and USA's clearances (left) show how the US was forced to deal with balls into the box, many of them due to Klinsmann's decision to force Mexico to the flanks. As the game entered its final 20 minutes, a respectable 0-0 draw seemed more the result of Mexico’s failure to convert (even Chicharito spoiled a couple gimmes) than of anything heroic on the part of the US. But the entrance of an out-of-form Brek Shea in the 78th created a moment that etched an otherwise dull game into the history books. It started with an awful giveaway by Mexico in their own half, a recurring them for both teams. When Shea – whose poor MLS form caused many to question his presence – eventually received the ball on the left wing, he produced the gusto that earned him world-wide attention last season. He drove straight into the Mexican defense, beating 3 defenders and crossing a ball which richocheted to the feet of substitute striker Terrence Boyd, who cheekily back-heeled for fellow sub Michael Orozco Fiscal to sloppily sweep it into the net. You knew the heat was coming from Mexico in those final minutes, and the only thing which kept victory in the hand of the US was Timmy Howard’s cat-like reflexes, and perhaps a nod of fortune from Montezuma himself who, after 75 years, allowed his Tri to be conquered. For the second time, Klinsmann has pulled off of notable victory against a formidable international opponent on their own soil. The taking of Italy was a cautionary cause for optimism, but this victory in Azteca, though it has less tactical meaning given the missing players, still feels much, much better. - I’m very encouraged by Cameron’s performance. While not perfect, it was good enough to warrant serious thought about pairing him with Bocanegra going forward. - Switching Edu to center back has potential. His speed and physicality are welcome in that spot. But he needs work on his positioning. However, with the glut of holding mids, his moving to the backline may be a good for all. 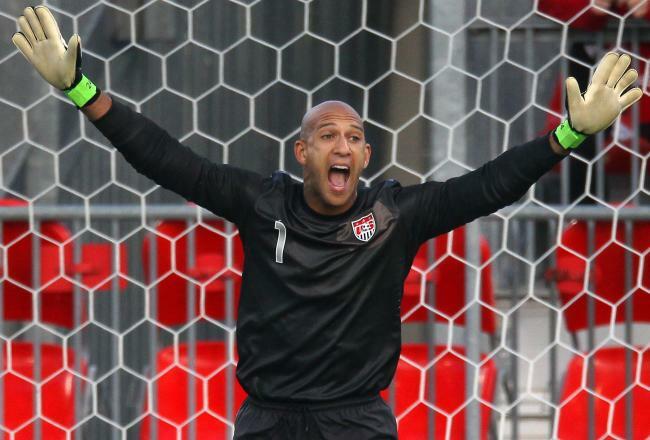 - I’m still concerned about Klinsmann’s reliance on playing fifteen holding mids. Can we just pair Williams with Jones or Bradley and see how that works? And then perhaps we can play an actual right mid at right mid… yes? - Torres… I hate to say it because I really do want him on the squad, but JK might have to go away from Torres for awhile. I think he is a player without a position on JK’s scheme. It’s too bad, but we really were playing down a man in the first half and that was totally unacceptable. - And last, a tip of the cap to Klinsmann, Timmy, Brek and the boys. A stout effort in the back, a little forward impetus, a dash of luck and behold – a tremendous upset is born. While this game did not advance our development, technically speaking, it will do wonders for the psyche of the team – and you need those types of wins occasionally as well. Cameron and Ream give me hope that someday we might have a center back capable of a killer pass. I am somewhat in agreement about Torres. In my opinion, his best role is to be the link alongside Bradley when we play lesser opposition.